A fillet weld is the most common weld type in steel building construction. According to EN 1993‑1‑8, 4.3.2.1 (1) , fillet welds may be used for connecting structural parts where the fusion faces form an angle between 60° and 120°. The effective throat thickness a of a fillet weld should be taken as the height of the largest triangle (with equal or unequal legs) that can be inscribed within the fusion faces and the weld surface, measured perpendicular to the outer side of this triangle, see Figure 01. According to EN 1993‑1‑8 , the design resistance of a fillet weld is usually determined using Directional Method or Simplified Method. The Directional Method is described below. The normal stress σ|| parallel to the axis is not considered when verifying the design resistance of the weld. 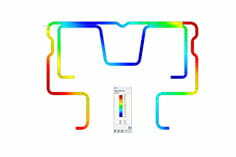 Design of a fillet weld of the beam displayed in Figure 03 from . In SHAPE‑THIN, the shear stress (in the plane of the fillet weld surface) parallel to the weld axis τ|| can be calculated on fillet welds, and the resistance can be designed. When modeling, the weld must be connected to the edges of two elements. One of these elements can also be a dummy element. Figure 04 shows the weld definition for the example described in this article. Table 5.1 Welds displays the resulting stresses τ|| for the welds defined in Table 1.6 Welds. Figure 05 shows the weld stresses for the example described in this article. Petersen, C. (2013). Stahlbau, (4th ed.). Wiesbaden: Springer Vieweg.